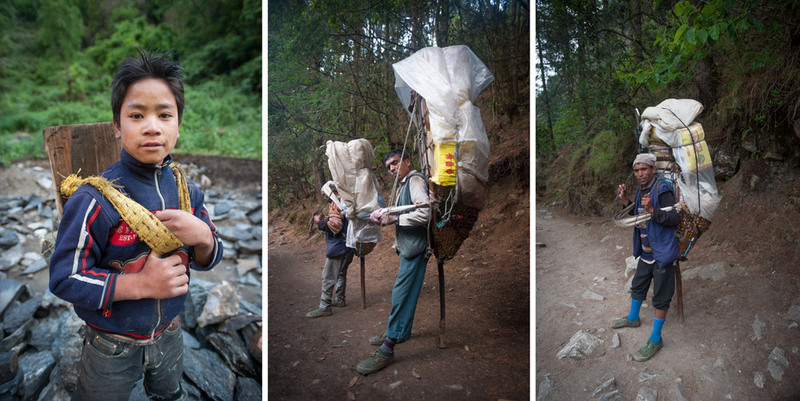 Whilst shooting for Berlitz a couple of months back in the Himalayas, I became interested in the porters I'd see daily. Eyes bulging with the strain, heads bowed, they made progress at funerial speed. Many of the mountain paths are impassable even by donkeys so just about everything has to be carried from the towns below on the backs of these men and women. It's surely one of the hardest ways to make a living; days of trekking at altitude carrying loads of 70kg or more, with home-made backpacks and often wearing sandals. Their mantra is the title for this post and I heard it frequently. One guy I met carried a 114kg pastry oven on his back for 11 days up to 4.500m so they could bake muffins for the tourists.